Group cuddle, c. 1952 – mom, me, and teddy bear, one of my favorite toys. 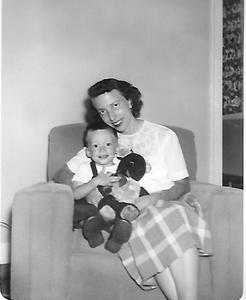 After many hours of labor, my mother Elinor gave birth to me on July 3, 1951. Since Dr. Hauck, mom’s physician, determined I wouldn’t survive a natural birth, he performed a Caesarean section. Mom later described the first physical features she noticed, my “big, bright blue eyes and beautiful hands with long, slender fingers. In her hospital room, her whispering spot, God’s voice was the loudest voice. And mom leaned toward His whisper. 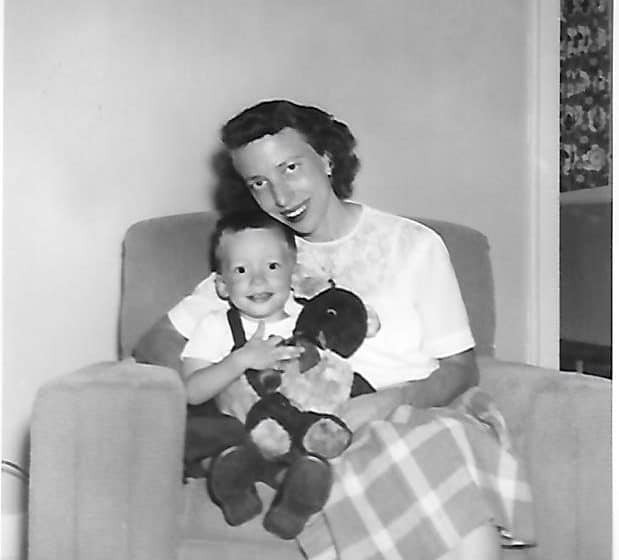 As a result, mom probably thought of her twin brother Elmer, who asked for violin lessons at the age of nine. Beginning with the second semester of his freshman year at North Division High School in Milwaukee, Uncle Elmer was chosen to play in the senior orchestra. Eventually, he held the seat next to the concert master. At the age of three, my parents bought me an inexpensive portable record player. My first choice of records consisted of an album of marches. Also, mom and dad enrolled me in a record club, introducing me to classical music. Furthermore, as an alto in Ashburn Lutheran’s Children’s Choir, my sense of pitch kept me from getting thrown off-key by the sopranos. Through the silence of proactive listening, we battle daily against the competing voices within us. But with each small victory, God’s voice gets a little louder in our lives. With perseverance, God’s voice becomes the only voice we hear. To bring this to fruition requires listening with more than our outer ear. We need to give God a second hearing with our inner ear. As a result, His truth gets from our head to our heart of hearts. The loudest voice in your life defines the image that shapes you. This Easter, tune your inner ear to God’s whisper. Come awake to the loudest voice in your life.